The emerald woods stand guard over the sun-bleached pasture and the tinkering tide. Behind that impressive wall of cathedral-pillar Oaks, and into the dense green shade, bird song echoes like words lost in a vast cavern. 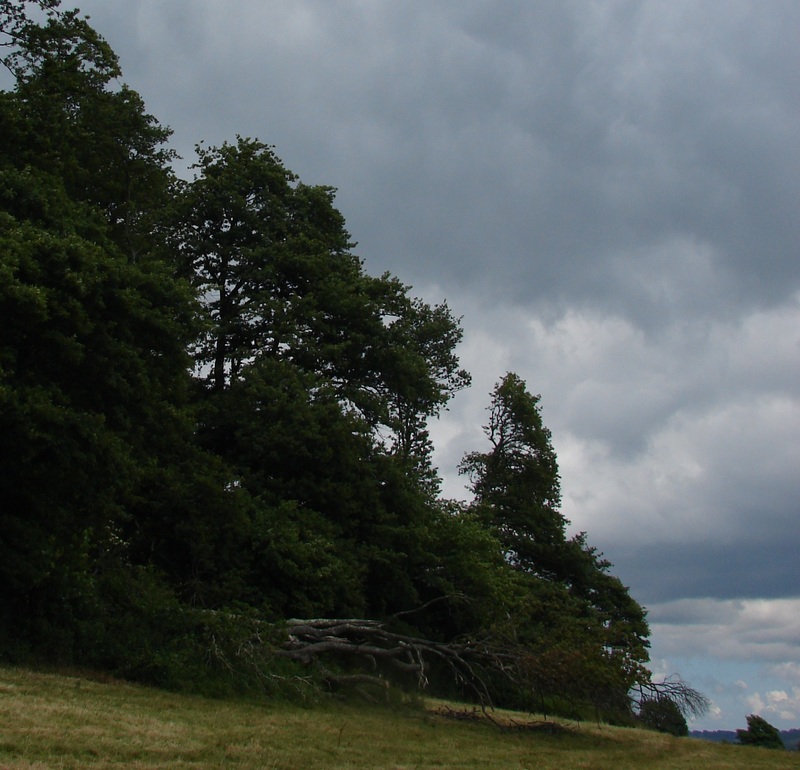 The wind, who strips off grass seeds in the pasture, is subdued by the forest of proud trees. All it can do is skim through the canopy, tickling the leaves into a slow-puncture hiss. 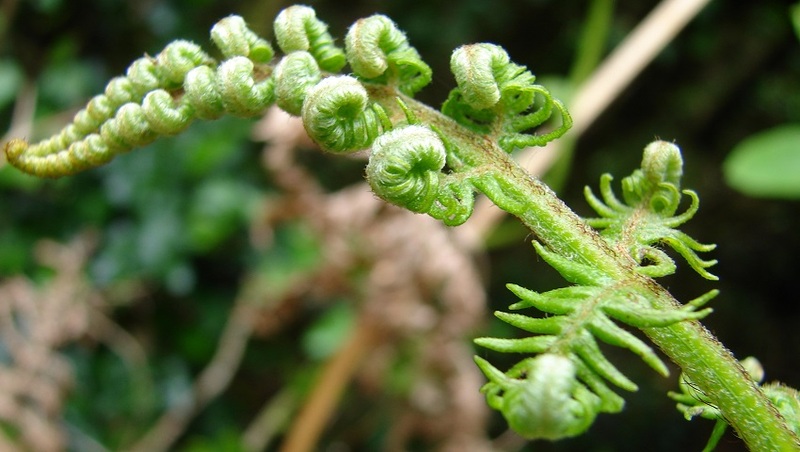 Bracken unfurling in the shade. And the birds mutter their tick-tocking, whistling songs. All you get is the odd glimpse of a small shadow, firing itself from branch to branch, or the machine-gun burst of a woodpecker drumming his territorial beat. Woven up into the wind’s hiss and the sounds of life, a stream talks. It rolls a silver tongue that arcs around tree-trunks and moss-claimed stones. The flowing water murmurs at the trembling leaves, as it bends and trips its way to the edge of the forest. If the wind ever gathers pace, infiltrating the quiet jade-green woods, the Oak trees groan. A tense, bass creaking shudders through the woods, and it always makes me think of an ancient, matriarchal elephant, leading her herd to water. If you’re lucky, you’ll hear a sharp crack – a lightning snap – as you catch the rare moment when a branch gives in and fractures, falling into the shadows of the floor. Where woods meet fields, two worlds are separated by an invisible portal. But the wind is never strong enough to destroy the forest. Half-dead trees hang on by a thread, toppling into those that are still standing. The strong become crutches for the weak and the fallen, so woodlands are criss-crossed by trees leaning into each other like teepee poles. The woods stand the test of time, guarding the sunlight-speckled world below from the anger of the weather. Wander in, and you’ll be protected by the world of fissured trunks and the emerald stained-glass safety of the trees. This entry was posted in Adventure, Britain, Nature, Place, Wildlife and tagged Adventure, Britain, Forest, Natural World, Nature, Walking, Wellbeing, Wildlife, Woodland, Woods. Bookmark the permalink. This is beautiful and captures the spirit of the place. Well, that’s very kind of you, but the credit’s got to go the woods hasn’t it! Still, thanks very much. Of course Nature has got to take the credit but allows us to collaborate in a meaningful way, through words and images to convey its beauty. That is what is what I meant. It is a deeply spiritual experience. Yes. It’s all about the quiet protection of the great woods. An ancient wood especially holds a particular feeling like a medieval cathedral. Love the entries man! Yes. The great woods hold a very unique atmosphere like the accumulated wisdom that comes with the passing of deep time like a medieval cathedral. Love the entries man!